This region is anchored by the Basilica of St Mary Major which was constructed in honor of the Blessed Virgin Mary by Pope Sixtus III shortly after the Council of Ephesus. It replaced an earlier church that had been built by Pope Liberius in the 4th century. At this council the church solemnly declared that the Blessed Virgin Mary was the Mother of God to protect against the Christological heresies that attacked the full divinity of Jesus. Thus this Marian dogma helped to strengthen the doctrine that Jesus was both fully human and fully divine. This region, therefore, is steeped in tradition and many of its relics go back to beginnings of the church. Begin this route from the Train Station at Termini. The church of Sacro Cuore di Gesu a Castro Pretorio is not far from the northeast exit of the train station. After visiting this church continue as the following map indicates to Via Urbana to visit Santa Pudenziana. From here it is a short walk to the Basilica of St Mary Major. After an ample visit to this great basilica depart and head south to visit both Santa Prassede and Santuario della Madonna del Perpetuo Soccorso. From these churches continue south to Viale del Monte Oppio. Turn right on this street to visit San Martino ai Monti. After visiting this church continue west on Viale del Monte Oppio which will turn to the right and become Via delle Sette Sale. This quiet road will lead you directly to San Pietro in Vincoli. Finally cut across as the map indicates to visit Santa Maria dei Monti. The following churches are listed according to the order of the suggested route. The total distance is about 1.5 miles. To walk will probably take about 5 hours when one stops at each of the churches. The churches are generally open from 7AM-1PM and from 4PM-7PM. Sacro Cuore di Gesu a Castro Pretorio & Santa Pudenziana, may not be open as frequently. The Basilica of St Mary Major is open from 7AM - 7PM and does not close during the pranzo hour. *This church is near the Termini Train Station. It was built by St John Bosco and finished in 1887. The church continues to be served by the Salesians. *St John Bosco (d. 1888) celebrated Mass at the altar in the left transept. It was at this altar that he profoundly realized that his life had fulfilled the vision he had as a youth. *This church is west of the Basilica of St Mary Major. *It is believed that St Peter lodged here while he was in Rome. The house in which he stayed was owned and provided for by St Pudens, a Roman Senator. Since early Christians did not have public places for worship it is also presumed that St Peter celebrated Mass here. Remnants from the ancient wooden altar used for these Masses are said to be preserved in the chapel dedicated to him on the left side of the main sanctuary. *The remains of St Jerome (d. 420) were brought to this church in the 12th century. There is some doubt as to their exact location. They either rest under the Papal Altar within the main body of the church or within the confessio in the right transept. *Within the Pauline Chapel in the left transept is a miraculous image of the Blessed Virgin Mary entitled Protectress of the Roman People. Tradition credits St Luke for the creation of this image. 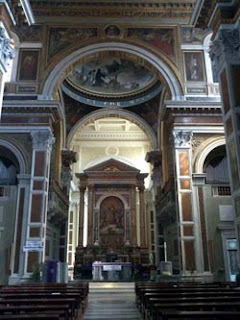 *This church is just south of the Basilica of St Mary Major. *In a chapel on the right side of the nave is said to be the Pillar of Christ’s scourging. Its authenticity, however, is doubtful since the quality of its marble seems to be too good for the punishment of criminals. A more realistic specimen is venerated in the Church of the Holy Sepulchre in Jerusalem. *This church is just south of the Basilica of St Mary Major and it is dedicated to St Alphonsus Liguori (d. 1787). *A miraculous image of the Blessed Virgin Mary entitled Our Lady of Perpetual Help is above the main altar. *A tradition claims that St Sylvester I (d. 335) and many other bishops met here to prepare for the Council of Nicaea. They then reconvened at this same church after the Council to announce the newly formulated Nicene Creed. Constantine was in attendance for this. The large painting on the left side of the nave created in 1640 recalls one of these meetings. However, this tradition is often tied to the ‘Symmachian Forgeries’ thus throwing some doubt on its credibility. Nevertheless, it does seem probable that some agreement was achieved between Constantine and St Sylvester I that allowed for the success of the Council of Nicaea. *A tradition claims that St Peter was condemned and imprisoned near this site. Venerated within the confessio are the chains of St Peter. A tradition holds that these chains are a result of the chains from St Peter’s imprisonment in Jerusalem coming into contact with the chains from St Peter’s imprisonment in Rome. Miraculously these two chains were fused into the one inseparable chain that is now found in the confessio. *Michelangelo’s famous statue of Moses is on the right side of the nave. Within the crypt are said to rest the remains of the seven Jewish brothers who lost their lives in 2 Maccabees 7. They were acquired in the 6th century by Pope Pelagius I. *This church was built due to a miraculous discovery of an image of the Blessed Virgin Mary in a nearby Poor Clare convent that had fallen into ruins. To celebrate this great find Pope Gregory XIII (d. 1585) commissioned the building of this church. This miraculous image is now placed above the main altar. *Also St Alphonsus Liguori (d. 1787) said Mass here from April to June of 1762 and St Paul of the Cross (d. 1775) did the same from 1745-1767. *St Benedict Joseph Labre died here in 1783. His body is enshrined on the left side of the nave.